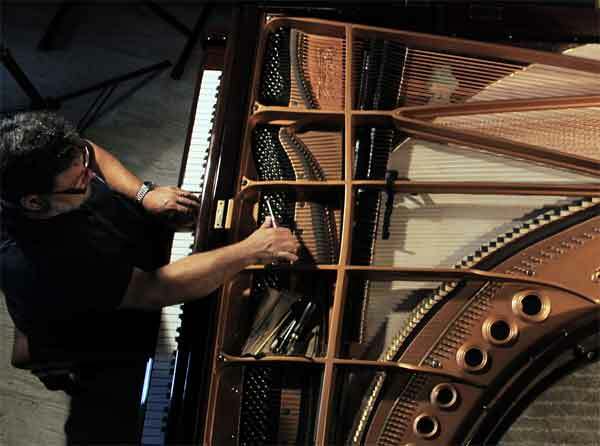 The soundboard is piano’s most important part – its own heart and soul. Traditionally soundboards were made by gluing parallel spruce boards forming a piano shape wooden plate. This was supported by ribs glued vertical to the grain on one side (back) in order to stiffen it in all directions and form a stable matrix. This plate is only supported around the piano allowing it to move freely, as a drum membrane does. Strings transmit their vibration to the soundboard through the bridge and all this system has remained standard more or less for the last 300 years. Although simple at first glance, the soundboard is an extremely complex system and a great challenge to build one. This board involves numerous interactive parameters that can either cancel one another or work together to an ultimate balance. And furthermore, there is not one perfect “recipe” in the same sense that there is not only one type of a beautiful human being. The foundation of an efficient soundboard is the tonewood, which in this case was mostly red spruce. There are 42 species of red spruce and they all exhibit low weight and high stiffness – two contradictory characteristics. Our choice is on Sitka spruce which is the leader in modulus of elasticity (top stiffness-weight ratio). The tree is chosen from the west Pacific coast’s rainforest high in the borders of Canada and Alaska and only 3% is processed as tonewood. We chose our tree to be over 600 years old, to grow on north slopes over 2000 m altitude and on rocky well drained soil and to antagonize its neighbors for a little more sunlight. The boards are radially cut and must follow a certain color code, resin content and grain count. 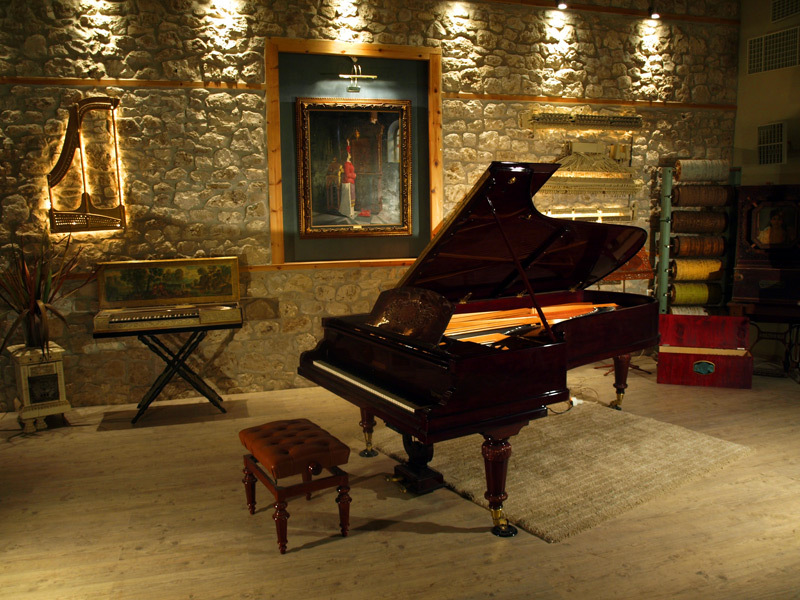 After a 5 year slow natural drying our boards are ready to give a chance to a superb piano. It seems as if the soundboard remains basically the same for hundreds of years and most improvements were accidental. Through the disassembly of old aged high end pianos we discover ingenious ideas from brilliant craftsmen that dimmed in time and were never recorded. We now try to understand what more can we do to develop a more singing piano with more swell and projection, less aggressiveness and more powerful 5th and 6th octaves. On the way we realize that a lot of what we claim as our own great discovery has been already invented before and lost in due course. On the other hand we do succeed on new ideas that verify our conviction that pianos can be improved and that they are still in their adolescence evolution wise. Ideas like increasing the stiffness and lowering the weight, applying variable curvature and thickness, handling impedance and loads like dealing with many instruments in one foundation. We have proceeded in a new soundboard design that has never appeared before in piano building. We thought that traditional soundboard design has its limits, so we departed on a new structure that basically looks like a fan and is built in variations according to end use. This has been patented and represents what we call “handmade piano” giving us the freedom to adjust our steps using traditional luthier’s techniques.